Normandy: A Graphic History of D-Day – Book Review | Armchair General Magazine - We Put YOU in Command! Frequently, when my miniatures gaming friends and I take a break from moving "toy soljers" around tabletops and complaining about bad dice rolls, we get onto the topic of how hard it is to get young’uns today interested in history. Invariably, that leads to talk about how we got hooked on history, and we all agree it was because when we were kids history, especially military history, was prevalent in pop culture, with TV shows like Combat and Twelve O’Clock High and movies like John Wayne’s The Alamo. And of course, there were comic books: Our Army at War (aka Sgt. Rock), Sgt. Fury and His Howling Commandos, Enemy Ace, Blazing Combat, and bunches more. The versions of war and other historic events presented in these various media were often, shall we say, less than accurate. But they were entertaining and accessible, and they planted the seeds from which our interest in history grew like Topsy, leading us to have multiple bookshelves in our homes today, overflowing with "legitimate," nonfiction books. Military history largely faded from pop culture for a time, a backlash against the Vietnam War and a perception that war stories and toys lead to violent behavior in children. 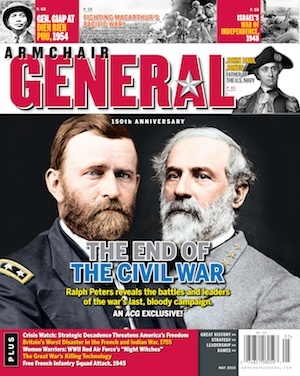 But Zenith Press, known for its standard historical publications (i.e., 99% text-based, with footnotes and everything), several of which have been favorably reviewed on Armchair General, has just released what many would call a "war comic"—and it doesn’t bend history in the story it tells. Normandy: A Graphic History of D-Day; The Allied Invasion of Fortress Europe, adopts the comic-book, graphic-novel style of illustrated panels accompanied by a bit of text to tell the story of the June 6, 1944, invasion of France through the August 25 entry into Paris. Unlike the mostly-for-entertainment comics of my childhood, this book gives an accurate overview of the events it relates and provides a surprising amount of detail, given its limited-text, just-over-100-pages format. It isn’t just for younger readers, either, although it would serve as a great introduction to the Normandy campaign for pre-teens and teens. As with any overview, how much new information a reader learns will depend on how knowledgeable that reader already is on the subject, but Normandy‘s attention to the details makes it worthwhile for adult readers. One of the elements that impressed me most was that the book isn’t just about the Americans. Actions of the British, Canadians, Poles, Free French, and, of course, their German opponents are also given more than just a passing nod. While some of its chapters cover big-picture subjects (no pun intended, for once) like "Bloody Omaha" or "The Cobra Strikes," the heart of this book is in its anecdotes about individuals or small groups, such as the story of Stanley Hollis of Britain’s 6th Green Howards using a Sten gun and hand grenades to capture a German bunker, or Michael Wittman’s rampage with his Tiger tank at Villers-Bocage, or Free French soldiers phoning family and friends from the outskirts of Paris to say they’d be home soon. My personal favorite among these anecdotes was that of Staff Sergeant Harrison Summers, 101st Airborne, who fought a five-hour battle with very little support to take a German coastal artillery barracks, killing 100 and capturing 31. I don’t profess to be an expert on the D-Day operations, but I’ve read books and magazine articles about it, and I’m ashamed to say I never heard of this Distinguished Service Cross recipient—called by some the "Sergeant York of World War II"—who lived and is buried in Marion County, West Virginia, adjacent to the county where I grew up. A letter is now in the works to my friends in the Marion County Historical Society about increasing awareness of this man’s service, as they did a few years back for another of the county’s heroes, George S. "Spanky" Roberts, deputy commander of the Tuskegee Airmen. Normandy is divided into 15 chapters, from "Second Front Now"—which provides background on why the Normandy invasion was needed and why it took place where and when it did—to "Aux Barricades!" about the liberation of Paris. Wayne Vansant found the right mix of text and illustration in creating this book. The short sentence structure imposed by the graphic novel format adds to the story, giving an enhanced sense of action and urgency. Of course, this ain’t Vansant’s first rodeo: he’s written and/or illustrated a number of historical works, including Antietam: The Fiery Trial for the National Park Service. The Vietnam War: A Graphic History, which he illustrated, won the 2010 Gold Medal, Artistic/Graphics category, from the Military Writers Society of America (Dwight Jon Zimmerman and Chuck Horner were the authors). He was also the primary artist on the Marvel Comics series The ‘Nam for over five years. As with any work in which space is limited, the argument can be made that the information isn’t in-depth enough, but that isn’t the purpose of an overview. There are a few errors, such as the typo that has barbed wire in front of the British 50th Division being cleared by a "frail" tank. (No, you idiot, I told you to bring up a flail tank!) Company Sergeant Major Stanley Hollis is identified as "Command Sergeant Major," which I believe is an American rank rather than British, but I found no more such errors than I would expect to find in a more traditional history book. Unless you are just totally turned off by the comic book–like format, check out Normandy: A Graphic History of D-Day. It’s a good, short, informative read for adults and an excellent tool for introducing younger readers to the story of D-Day. Highly recommended. Gerald D. Swick, senior editor of the Armchair General Website, has been reading history books and playing wargames since … well, a long time ago. A job he held some years back required him to start reading comic books again, and he discovered how much American comics had changed since the days when he bought them for a dime. As soon as he finishes reading Bully! The Life and Times of Theodore Roosevelt, he’s looking forward to the latest Blacksad anthropomorphic noir graphic novel.